Gaithersburg, Maryland, USA – December 09, 2013- GL Communications Inc announced today its enhanced T1 E1 Voice Call Management Utility software. A critical feature of the CMU is the ASR Listener, which provides the capability to remotely access recordings in progress (real-time) as well as access to historical recordings. 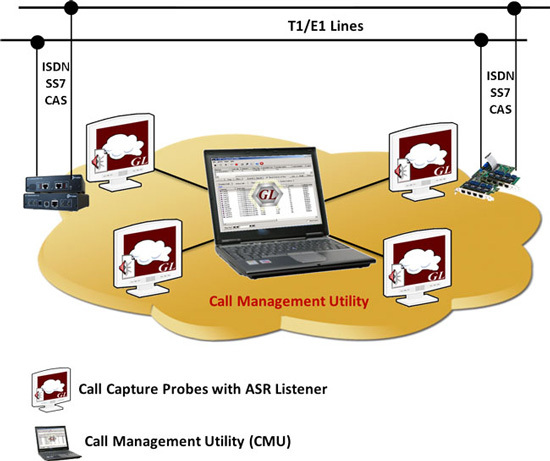 He added, “GL’s Call Management Utility (CMU), coupled with the GL’s T1 E1 Call Capture and Analysis (CCA) application provides all the necessary management tools to perform exactly such monitoring functions for ISDN, SS7, and CAS calls over T1 or E1 networks. Call records are immediately generated, indexed, and displayed once a voice recording over T1 or E1 lines is completed by the CCA. Mr. Bichefsky further added, “The post processing capability of CMU provides filtering of calls of interest that is recorded calls can be filtered or played back or analyzed as required. All relevant information associated with each recorded call is included e.g. timestamp, direction, timeslot, length of call, size of file, calling #, called #, and voice file name. The user has the option to display all “in-process” calls or a user-defined filtered list of all completed calls. Also allows the user to import a previously saved log file, or an instance, or the captured files from the call capture directory. When importing, the user has the option of adding a filter to the search criteria. Thus, the user may import all voice files or import only those that adhere to the search criteria.